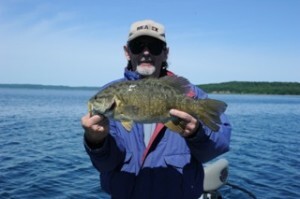 This gentleman came all the way from California, to fish with Traverse City Bass for 4 full days. 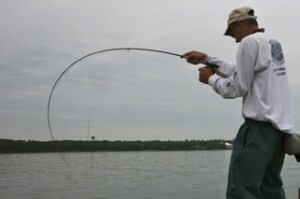 Glen is completely blind, and was still able to manage to fish very effectively and efficiently. 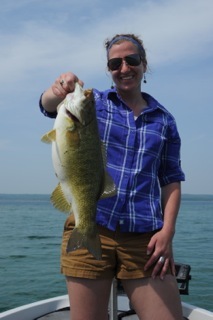 There were lots of laughs, lots of fun, and just as importantly, lots of fish. Captain Ben Wolfe was able to get Glen out on both West and East Grand Traverse Bays for each day of fishing. Morgan, from Charlevoix, Michigan, caught this giant smallmouth while fishing out on Grand Traverse Bays with Captain Ben Wolfe and Traverse City Bass Guide Service. Wow, what a toad!!! 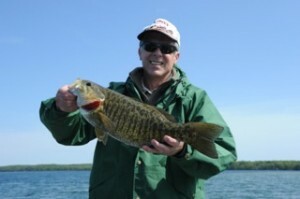 Jeff fished an inland lake with Traverse City Bass to land this big smallmouth. 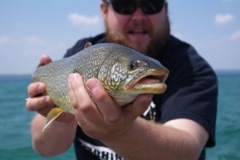 Wolfe Outfitters fly fishing guide, Matt Dunn, with his very first lake trout. Way to go Matt! Hopefully there will be plenty more fly caught lakers in Matt’s future.